The religiously less aware female psychology has developed some strange traits. Self-pity has become a strikingly destructive habit. There is nothing created by Allah (swt) which can make a person take pity on himself. Even if you live out in the jungles, Allah (swt)’s protective Hand is over your head. Should you pity yourself? Should you crumble your existence? Self-pity is the first step towards the menace called ‘Depression’ and it branches off into a billion dimensions of dysfunctional mental and physical health. Psychiatric health authorities of the USA have named countless ‘disorders’ that bud from depressive states. Fears and phobias, deviancies, diseases and relationship disasters are all parasites that you willingly attach to yourself when you trigger off depression. And self-pity is the ticket that you provide to the menace of depression to ride on board your mighty flight of self-esteem. It slowly corrodes the machinery on the inside and before you know it, you crash land and collapse. If you regularly count your blessings each day and persistently thank Allah (swt) daily, how could you possibly be depressed about anything? Sure, we all have hormonal influences which make us feel depressed but those are cyclic. The prime concern is the central lifestyle. If salaah (prayers) that is offered 5 times a day is an integral part of your routine, it is similar to injecting yourself with an anti-depressant or taking an anti-anxiety pill. Guess what? No side effects. And believe me, we have a lot to be thankful for. That is the reason why initially 50 prayers were prescribed for the Muslim Ummah when Rasool Allah (saws) went for Isra and Meraaj. Self-pity triggers off when we compare and astaghfirullah (may Allah forgive us), we women love to compare. We look around and we find a million reasons to compare ourselves with. She has better clothes than mine..., her jewelry is more expensive than mine can ever be..., her complexion is fair than mine... and the list is endless. Ladies sitting in the Jumaah khutba (sermon) are doing this! If not talking it out it’s going on inside their heads. An idle mind is the devil’s workshop, they say. And the devil readily instills depression inside the head. The best combat is verbal! Say “Alhamdulillah! (all praise is for Allah)”, for what you have and what you see on someone else. Sometimes self-pity; among women, emerges from their philosophy about their hijab. Hundreds of sisters have issues of self-esteem because of their hijab! Yes, they feel inferior to other women because of not being able to participate in the glitz and glam of this duniya (world). Would you pity yourself if you’re being modest to please Allah (swt) and not being able to achieve the “eye candy” status for this world? I say take pride in yourself, with modesty and humility of course, and assert your own eye candy flavor. 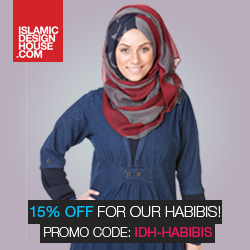 The modest and the sacred flavor of the hijab! It is the sunnah of the most pious ladies of all times; of Lady Mariam (salam be upon her) and of the Umm-ul-momineen (mothers of the faithful), not to be grimaced over. It is important to understand that hijab is a blessing that has been gifted to you and not just a head wrap ritual. It was the divine word of Allah (swt) for his most beloved Ummah on earth. Another reason why women end up mocking themselves to be a symbol of sympathy is because they’re running the feminism race. Earlier in the series I mentioned that according to the divine balance, men are the stronger and supporting gender and women are the creative and the managing gender. None of them is exactly feeble or mighty. But if we try being dominant and we struggle for control; that’s when we feel weaker. Women cannot be masochistic; we are not made that way. So if we take a go at something that’s made of steel and we get our bones broken and then we self-pity then that’s foolishness. We’re not weak! We just have different strengths. There are things that women can do and men cannot. It is foolish to pity ourselves and instead we need to be thankful and acknowledge our strengths and say masha’Allah. None of Allah (swt)’s creation is created without a concrete and important purpose. In case men in your society are pressurizing you and insisting that you are physically weak then it would be silly to accept defeat and loose your self-esteem. You have the answers. You are the sanctuaries of the Muslim Ummah, Alhamdulillah, you raise a Muslim being in your wombs and then you bring it into the world by Allah (swt)’s Will and by all means that is one of the most strongest phenomenon known to man. If you count your blessings you would have answers to everything. And if you are always comparing and seeking for more, you’d feel like the most under privileged. And hence, your self-esteem would drain off. Masha Allah, a very beautiful article. May I borrow this to post in a yahoo group I am a part of?